George Khut looks a little coy. “I want to help people appreciate being alive!” he says. “It sounds naff, but I mean it.” From childhood practices in martial arts to later learnings in Feldenkrais, Khut finds somatic awareness invaluable, particularly in a culture where our bodies are problematised as things we love, hate or need to control and where authority over our wellbeing is often handed over to others. 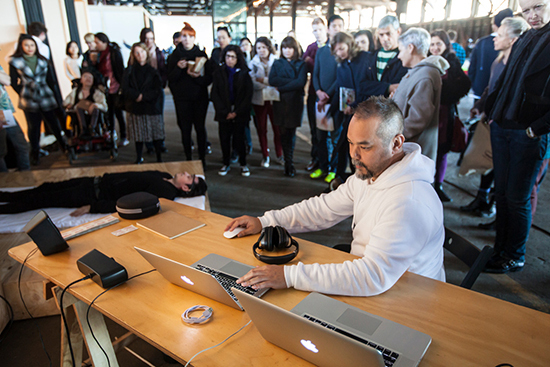 Khut works at the interface between art, technology and neurophysiology. He is a passionate and compassionate man. In an earlier project he devised interactive software for iPads to help children in hospital lower their anxiety levels before undergoing intrusive medical interventions. His new project, Behind Your Eyes, Between Your Ears, a video and installation work, is designed to provide insights into ways in which concepts of embodiment, agency, self-efficacy and cognitive/emotional self-regulation are reproduced and/or transformed through the experience of neurofeedback self-regulation. 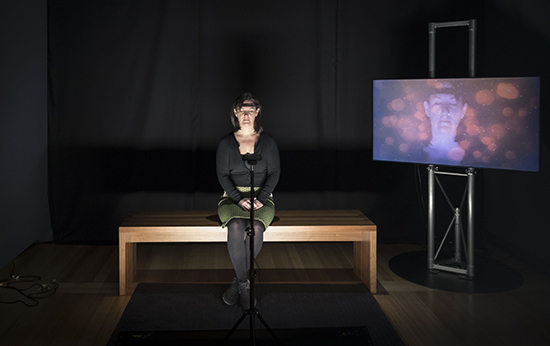 Over two weeks in July at Canberra’s National Portrait Gallery, in single sittings, volunteers were invited to become part of an interactive artwork that included being video-recorded, then interviewed and later asked to make drawings. Khut is artist, observer and researcher. The ‘artist’ part is significant: portraits are ‘tweaked’ in situ, both aurally and visually, and later as Khut renders and edits in studio, adds segments from the interviews and then posts a finished aesthetic result online. But the experiment also moves beyond the usual interface of self-presentation versus re-presentation by another to tap into a subject’s agency. As a volunteer, I arrive at the National Portrait Gallery with my signed ethics clearance forms. We are situated in the nexus between feeling and function, about which any researcher must be careful. I follow Khut into a labyrinthine corner of a gallery space, separated by a false wall. It is dark here, and a little secretive. Gallery announcements penetrate the space, as if from another world. Spectators—here, my family and friends—can huddle in a small corner, but their presence is incidental. Essentially I am given a goal to increase and sustain an alpha-wave brain state. A sensing device is fitted to my forehead and, over that, I wear headphones. After a calibration, where Khut’s software senses my threshold levels, the experiment begins. The software reads my brain-wave states and transforms them into sound and colour. The spectators see abstract geometric imaging—ranging from dark reds through to blue-green—which overlays my live video portrait projected on a screen. Initially I do not see these overlays as, eyes closed, my own attention is focused on the brainwave-influenced sound spectrum which varies from a crackle (linked to the alert, beta state) through to a sustained, gong-like sound. I only see the colour fields during the subsequent interview, when I see and talk to the full video document. A natural synaesthete, curiously I see no colours in my head. But then the experiment is about sustaining an alpha, not a theta or delta state. I wonder if that would make a difference. I forget to ask. Or rather, that is a question that only comes up much later. Within 10 minutes I score ‘high’ on sustaining the gong-like sounds and eliminate most of the crackle. But this is not meant to be a competition. In fact, I observe that ‘needing to do well’ causes a crackle, from thinking about thinking. Even certain kinds of penetrative focus I associate with meditation seem to interfere. I undergo my own inner calibration. Quite suddenly, the space around me becomes viscous, my bones clarify, spinal segments lift and fill. I become a clearer architecture, my attention sifting and settling through the silt of my body’s geology. I sit in all-time: old and new. It is a quiet and sustained pleasure, similar to but different from meditation. It is perhaps the self-regulation that is important: the crackling is definitely less pleasant than the other vibratory sounds, the gong-like vibration much more inviting. So is looking for pleasure a part of the project? Do we fundamentally desire peace? I have taken to the exercise like a duck to water, swimming in calm. I wonder if George Khut has ever observed an experimental subject who resists this. He finds it important for a subject to respond visually before verbally. At the completion of the sustained alpha-state exercise, I am taken into a second room. Here I am given two black A4 sheets, one with the outline of a body drawn on it. The other is a birds-eye view of a head. I am given a soft white pencil and invited to draw my experience of being ‘hooked in.’ I draw a cone spiralling from my head. I draw the awareness of my family watching. I draw a sense of weight in my feet. Only then do I view the video recording, with colour and sound, and give words to the experience. I emerge from this contemplative haven into a screaming world—cold sharp air, long queues, loud music, bad curries, conflicting needs. Oh brave new world. The discrepancy makes me reflect on how agency and volition to be well and calm are so heavily influenced by context. George Khut’s experiment has invited me into a state of being I can’t, for one day, maintain. Such contemplations, to make a sustainable difference, need practice, and contexts that want us to sustain our agency. If only, if only. Dr George Khut is an artist and designer working across the fields of electronic art, interaction design and arts-in-health. He lectures at UNSW Art & Design. 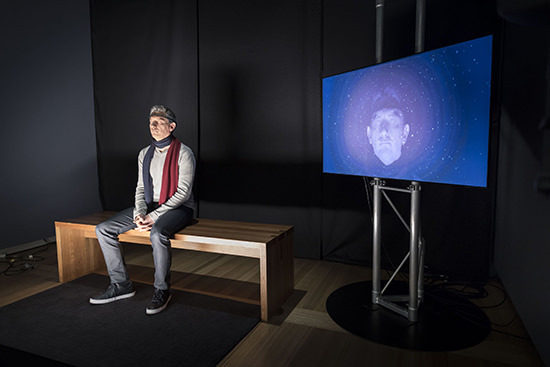 He was the winner of the 2012 National New Media Art Award, Queensland Art Gallery. For much more about George Khut see our extensive coverage of his work in the RealTime Media Art Archive. I spoke with George Khut shortly after he’d completed his residency at the National Portrait Gallery. Next, he says, he’ll analyse and edit the tapes he’s recorded, look at making an electronic book compilation of the portraits, interviews and the drawings the subjects made, and write an academic paper about the project. I asked him about the work he’s doing at UNSW Art & Design. Are you lecturing and teaching as well as doing research? Absolutely. Lots of teaching, lots of lecturing. So far I’ve been teaching a lot in the Design degree and in an in-between stream in the Media Arts degree we’ve re-branded recently as “Interactive Media.” It’s taking the place of subjects being taught within what was called “Cross-Media Arts.” We’ve put a more explicit focus on computation and interactivity. It’s available to students in the Fine Arts, Design and Media Arts programs in the second and third years of their degrees. The subjects are studio-based, but include the history of media arts practice, using it as a way for students to think through what they might want to explore and as a reference point for reflecting on their studio practice. What kind of work do they turn out? It tends to be fairly playful explorations of the behaviour and materiality of electronic systems; for instance, a video that responds to input from sensors that might be worn on a jacket. A couple of students had works in VIVID this year. You can say what you like about VIVID but its program offers a great space for students to cut their teeth and to observe how a mass audience engages with their ideas. One of our students, Jonathon Bolitho, co-created Attune, giant fibreglass crystals the public can sing into and which sing back with electronic melodies and drones which are paired with internal colour lighting. As a supervisor I’m interested in working with people, who already have a practice, thinking about the impact of their practice in public situations. I get really excited about how critical practice engages with and pushes ideas. One of my Masters students, Leanne Thompson, is an established artist with a background in sculpture and public sculpture in particular. She’s researching how she might incorporate real time environmental data in a public setting, in some sort of interactive sculpture. Leanne’s focus is on people’s relationship with threatened plants. She’s bringing her project to a very local level, starting with a tree species in Bathurst. Since you began working with interactivity in the 1990s, has there been significant progress in the field—by increments or leaps? I think it’s by increments. What’s interesting is that there’s a lot more critical debate around the meaning of participation these days, which is really healthy. Just because something allows people to participate doesn’t mean it’s intrinsically good. Issues around information and social media are obviously a big part of the [lives of] undergrad students I’m working with and when we’re thinking about media technologies. They’re already well-equipped to make work? Media technology is part of the fabric of their lives, but their ability to actually work with or hack into it can sometimes be limited. There’s a big transition to be made from being the consumer to being the producer. You’re still working using a highly developed bio-feedback practice. Is that an area you’ll continue to explore? Yes. We’re doing a series of research partnerships at UNSW Art & Design with the Black Dog Institute. Professor Jill Bennett is working on Anxiety 2017, a cultural program involving many institutions looking at art/science/medicine connections around anxiety and mental health. We’ve received some Catalyst funding for a suite of programs; one of those will include a version of the work I’ve been doing with heart rate and interactive visualisations. I’m also trying to work on a new project about ‘situatedness’ and geography but it’s very slow to get going. It’s something I’m working on with programmer and media artist Warren Armstrong. Situatedness—you mean having a sense of place? Yes, I’ve spent so long on body experience and the relationship between embodiment and identity and subjectivity, I just really want to move beyond a very individualistic idea of identity. How do we experience the idea of Earth? The intuitive experience of it is as flat but we know conceptually that it’s a rock in space. It’s really hard to embody that. We’ve got the blue marble icon but are there other ways we can spatialise Earth? I’m really interested in working with virtual reality technologies, augmented reality and very simple ways to spatialise so that people realise, ‘Oh, right. Yes, we are on a rock in the middle of space’ [LAUGHS] and all the limitations and precarity that goes with it. I’m trying to take the simple embodied, concrete, sensual things I’ve been doing with bio-feedback; figuring out how I might transfer that from the individual body and to the planet as a whole. Ambitious? I’ve been so conscious of the limitations of the bio-feedback approach and how it’s appropriated by Neoliberalism—everything is the individual’s responsibility and ‘here are some tools to relax and be more resilient so we can make your working conditions even more unbearable.’ I’m painfully aware of that aspect of it. Let’s talk about the structure of the course. In the first year are the keystone courses—introductions to everything. In the second and third years we get the students interested in interactivity and computation and such. Fourth is the Honours year where we focus on various research clusters. I teach in a cluster on health which is primarily for students in Design. That will change from year to year as we move onto different research themes. How you might support a health education campaign or designing for dementia sufferers, lighting environments, things like that. Finally, what was the outcome of the BrightHeart project you wrote about in RealTime in 2013 in which patients at the Children’s Hospital at Westmead used your heart-rate controlled artworks on electronic tablets to manage pain and anxiety? We completed the pilot trial and the results are all in. We’re just waiting to confirm the publication of the data. The next stage is to do some kind of randomised control trial. We also ran trials in high schools as well. Thanks George. Love your work! For UNSW Art & Design degree details go here.